Critical business processes, from project collaboration to product delivery are supported at every point by IT services. Failure of the underlying applications and infrastructure is not an option. For IT to be successful, it must have a method of monitoring operations, optimizing performance, and validating investments. ObserverLIVE is a fresh face in the VIAVI family. Part of the Observer platform, this intuitive software proactively assesses user experience with cloud and on-premises monitoring to troubleshoot problems and ensure network performance. Apex™ is a stand-alone appliance that simultaneously collects and aggregates data from probes, NetFlow devices, and other collection agents. Combine Apex with GigaStor™ to gain longterm views of network and application activities. Analyzer is often integrated with GigaStor, probes, and Apex to increase management performance power. It’s used with GigaStor for long-term data capture and in-depth analysis of historical events, forensics analysis, and stream reconstruction. 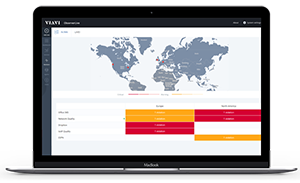 Analyzer is paired with Apex for high-level or aggregate reporting, enterprise-wide reporting, and global alerting. It also connects with larger enterprise initiatives, including integration with IBM® Tivoli® and HP® OpenView®. GigaStor is available in an array of form factors, network speeds, port counts, and capacities that range from . TB to over a petabyte. To ensure wire-speed and line-rate capture, all GigaStor appliances include the Viavi Solutions unique fullduplex Gen.™ capture card with multiple link support. There is also a software edition with GB or TB capacities that can be flexibly installed on a virtual machine or laptop. Analyzer integrates seamlessly with all GigaStor models to provide indepth analysis. OI converts data into actionable information through flexible reporting and intuitive mapping visualization. Its exceptional stand-alone polling capabilities can augment packet and flow data collected by Apex. OI delivers even greater management IQ, including functionality that locates correlations between seemingly unrelated events – saving hours of troubleshooting time and accelerating issue resolution. Observer Matrix™ Network Monitoring Switch is the perfect device to enhance the power of your monitoring appliances. Stop compromising on configuration or giving up on powerful features and functionality. With Matrix, quickly leverage all your legacy monitoring tools and get the right data to the right tool in a timely manner. Viavi Solutions brings end-to-end customer experience across service providers and enterprise organizations - helping you to Adapt, Transform, and Thrive! Our specialists are expert in designing data center solutions and can help you create a plan for sourcing and deploying your Viavi Solutions solution. Optrics offers personalized Viavi Solutions product training - a service designed to help you integrate your Viavi Solutions solution smoothly into your network infrastructure.